Chocolate Mint Live Plant 3'' pot. Home > Perennials > Herbs > Chocolate Mint Live Plant 3'' pot. 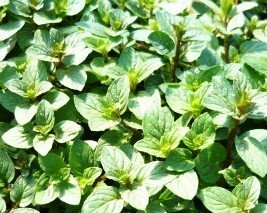 Chocolate Mint Plant-Popular culinary and tea mint. Small dark green leaves have a strong peppermint patty like scent and flavor. Easy to grow perennial in zones 4-9. You will receive One well rooted plants shipped in 3" nursery containers. The plant you will receive will be well-rooted starter plants shipped in their 3" nursery containers approx. 4" - 6" tall. The plants you receive may or may not be in bloom at time of shipment. Plants may be cut back for shipping purposes. Care instructions are included in each shipment and will greatly improve the success you have with your plants.